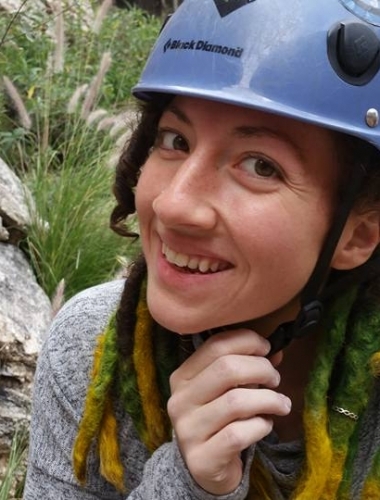 Home / Climbing / Local Limelight: Tina, Alex, and the van. 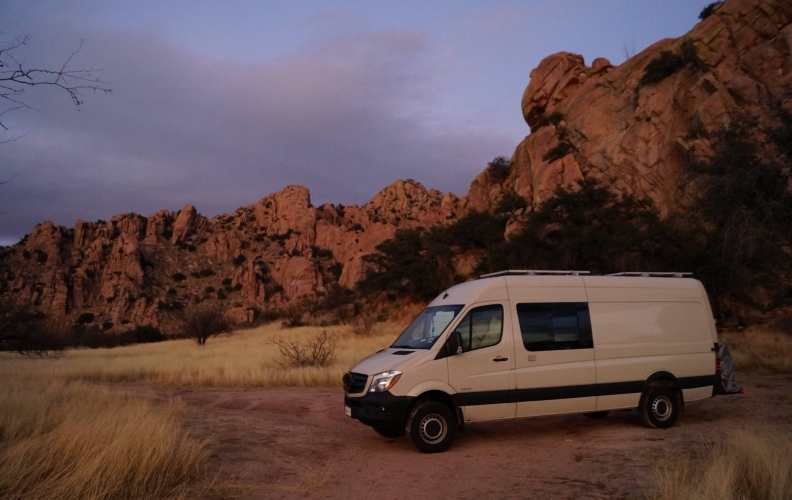 Van dwellers Tina, and Alex have gone away on a grand adventure! Where you might ask, and why you may question? I got with them on an interview via the interwebs and their sweet, hooked up van to talk about not only what lies ahead, but what they have been up to the last few months. Hey guys! Any exciting stuff go on since the last interview? Tina- We got married! 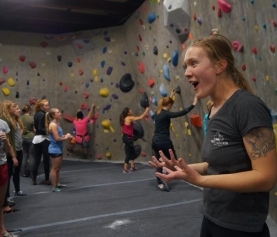 That was super fun to have all my hometown friends and climbing friends meet and get along. After we got married, we had to finish school responsibilities. (ugh life…) I had to complete a 560 hour unpaid internship at St. Mary’s hospital and recently just finished. We basically had two weeks from the end of my internship to the beginning of our trip, so we have been working hard to get ready. We did go on a trip to Red River Gorge, which was great because the climbing there is super fun. 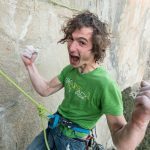 I worked on a couple 5.11a/b climbs and felt satisfied after leaving. Definitely will go back. Alex-I graduated from medical school, so you can address me as DOCTOR Alex now. (just kidding) and oh yeah we got married. We had a mini 9 day trip to red river gorge in October which was unseasonably hot and muggy but it was still really fun. I managed a couple of my hardest onsights there, 5.11a, which I was pretty happy about because they were on routes that aren’t my style (overhanging, endurance). Exciting! You guys make the perfect couple. How’s the van holding up? If that’s the worst it can’t be so tough, right? 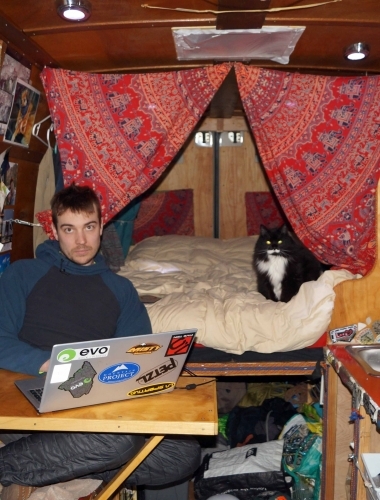 Tina-Living in a van is relatively simple. We have everything we need wherever we go. Going to Red River Gorge was easy to do because everything was packed and ready to go. We just showed up and grabbed our gear and headed for the climbs. I have also been saving money even with my unpaid internship. If I was living in an apartment in Portland, I would be still living paycheck to paycheck. Saving money has been extremely helpful while living on the go. Occasionally we will have to park our van on the streets in the city, which means that we put up curtains and cover the windows so that people can’t see in. We still need our privacy. I am excited for our trip because that means we will be staying in more remote locations which will give us the privacy we like. 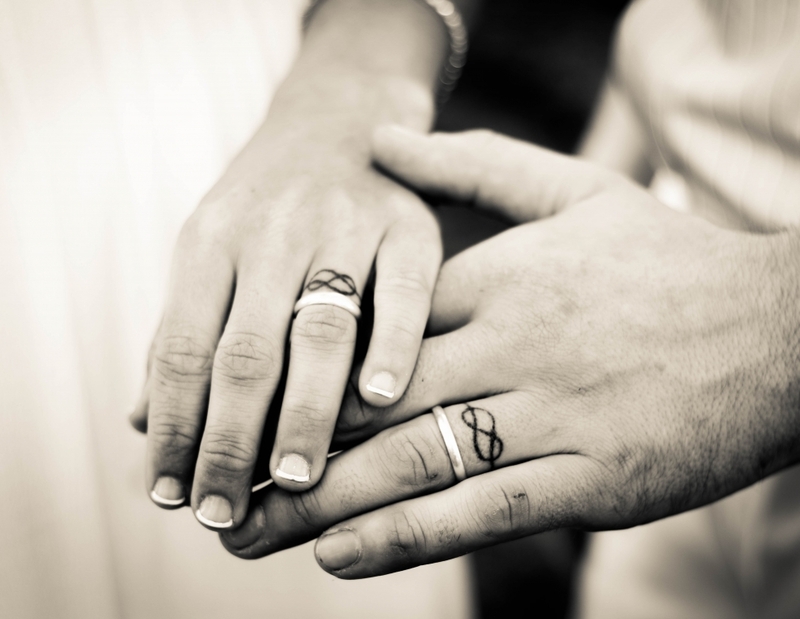 The rings, and hands of climbers in love. Where are you going with it next? Tina- We are heading out west where the sun is shining and it is not raining or snowing. Our first stop will be in Tucson where Alex has a friend from medical school. We will stay there for about a week. We plan on hitting Mount Lemmon, Milagrossa, and the Dry Canyon. After a week there, we will head to Joshua Tree for the first half of January. 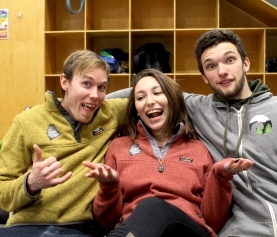 We are meeting some friends from Maryland who we originially met at Rumney, NH and will be bouldering, and hopefully doing more trad climbing. 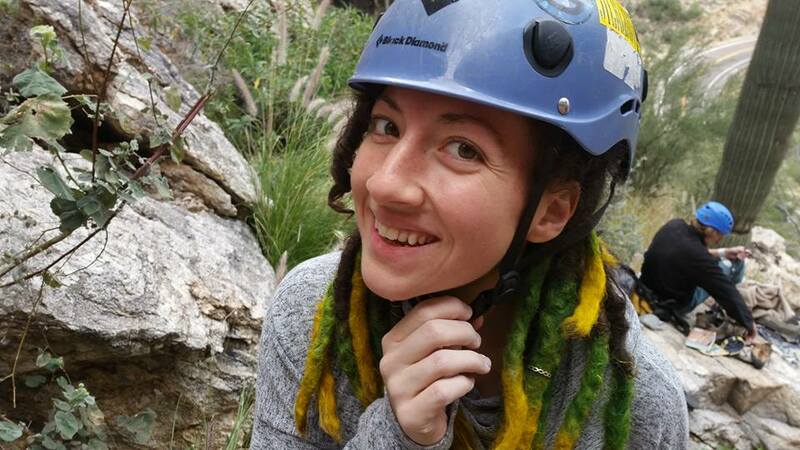 After that, we wanted to go to Northern Arizona and meet up with Zoe Hall (a former Evo employee and total crusher) and boulder at Priest Draw and sport climb at the Pit. We also want to see the Grand Canyon. Alex- Tina has never seen the Grand Canyon, and I haven’t been since I was very young. Depending on the weather and conditions in the canyon we might do some climbing in there or at least hike to the bottom or do a nice rim-to-rim trail that Zoe told us about (she said it was 26 miles but couldn’t remember if that was one way or round trip, that might be a key detail….). We are planning on returning to Bishop, CA for the whole month of February. On our trip last year we only got to spend two days there, one in the Happies and the other in the Buttermilks, we didn’t even get to hit the Owens River Gorge. After that we want to head to Red Rocks, NV and boulder in southern/central Utah (Moe’s, Joe’s, Triassic). We will probably leave that area after March and start to head up the Pacific Northwest. We will definitely hit Yosemite. We will be going to as many National Parks as we can because Tina hasn’t been to any besides Arches, UT and Acadia, ME. The farther out in the trip we look the less detailed the planning is because everything is subject to change and we just don’t know where we might be. We will be going to Smith Rocks, OR in April and as the summer comes we want to hit up City of Rocks, Vedauwoo, and the Lander, WY area. After that, we’ll probably go down to Colorado and spend the rest of our time there before heading back East. Wow guys. That’s like, some wicked radical stuff! Any particular projects your heading after? Tina-I have a few climbs that I want to return to. After our last road trip, I came back to EVO Portland with the intention of getting stronger and working on my mental game. 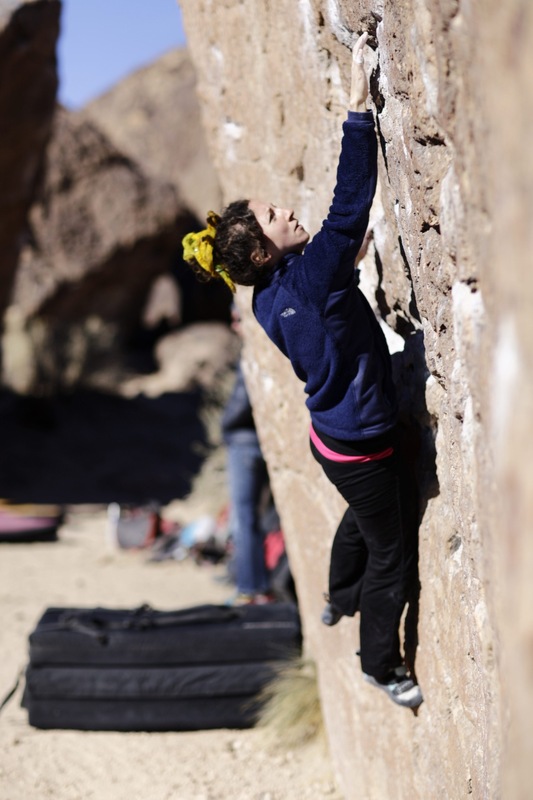 Most times its just my head that gets in the way of my climbing projects, I know I am strong so just keeping my focus on the goal and not being afraid of falling will result in my success. 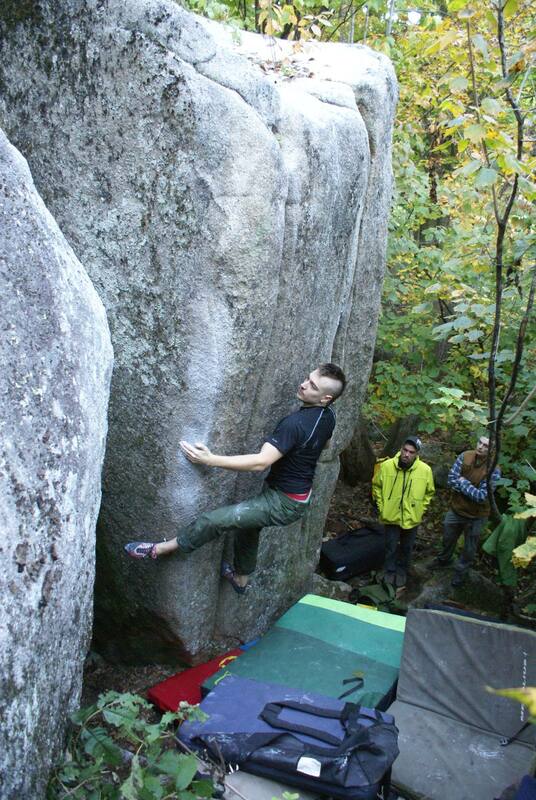 My goals are to project and send V5/6 and to continue to lead 5.11’s and start leading 5.12’s. I am hoping that by staying in an area for long enough, I will be able to meet these goals. Alex-I have a billion. 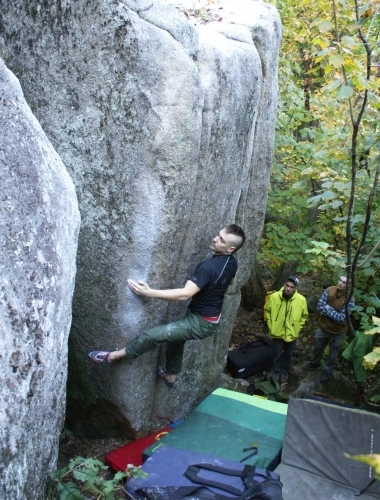 There is a route in Milagrossa that shut me down last year, a short, boulderly 11c. Other than that…. 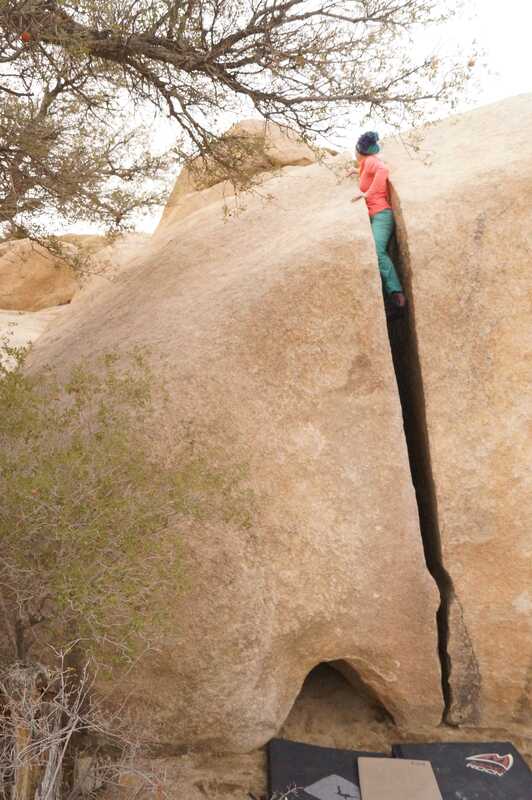 Streetcar Named Desire in Jtree, Atari in the Happies, Seven Spanish Angels in the Buttermilks, an unnammed, reachy pocket-y V6 in Triassic. 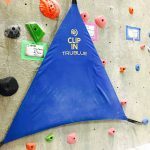 My other sport climbing goals are just to build my route pyramid on a variety of kinds of rock and route styles. I want to work on my weaknesses. 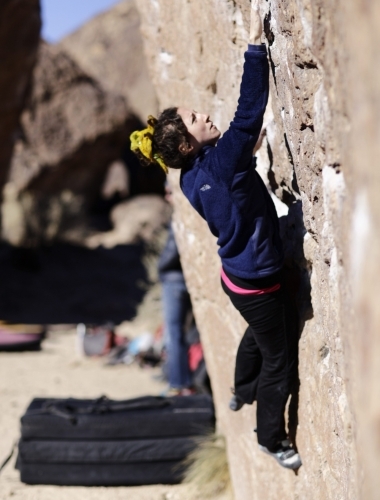 My attention span with route climbing is pretty short. I would much prefer to send several routes in a few tries than project one route for several days, and being able to do that requires a solid base. I’ve built a campus board and fitted a hangboard with a pulley system to the van so that we can train on the road. Very solid. What do you guys miss most about Maine, and EVO Portland? Tina-Definitely the community we have had the honor of being a part of. 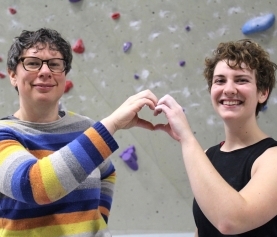 When we first moved to Maine, the Maine Rock Gym became our community. So now we are a part of the expansion and a larger community that has been so amazing. I will miss the east coast climbing and the amazing views that Maine provides. Alex-We love EVO! I will definitely miss spring and early summer season at Rumney, but I will not miss the bugs at Pway! It’s definitely going to be weird not having a home base, which is what we consider Evo to be. We definitely want to go see EVO Louisville too. Tina and Alex lead a pretty amazing life on the road. 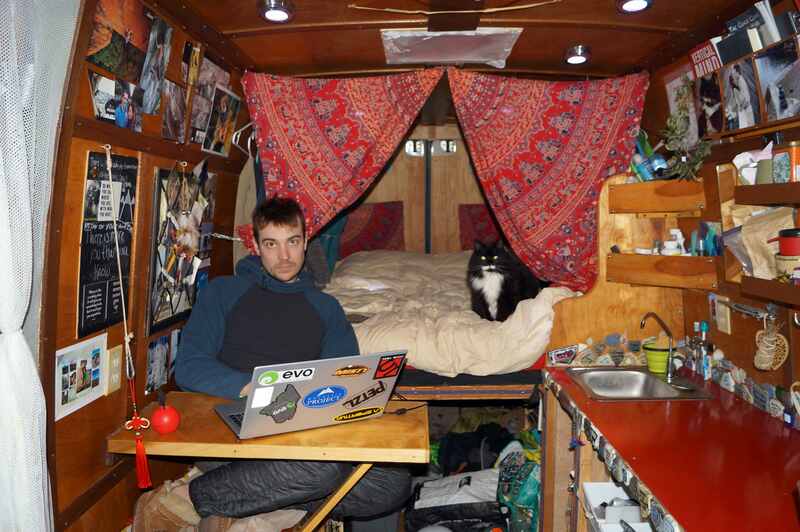 You can follow their adventures on Instagram @livefreeandvanlife and at their blog. Thanks for reading, and we’ll catch up with them again next time!